Exporting 90 per cent of vehicles abroad Degroote is widely acknowledged as No.1 in Belgian market of used commercial vehicles. In Degroote truck lot there are always above 1500 vehicle units for sale. … details Degroote has been operating in European second hand automarket for over 35 years. In spite of the fact that Belgian truck dealers are not so popular with European haulage companies, Degroote managed to compete with Dutch and German dealers rather successfully for years. Since its foundation the company has grown and developed into a well-known leader in Belgian automarket. 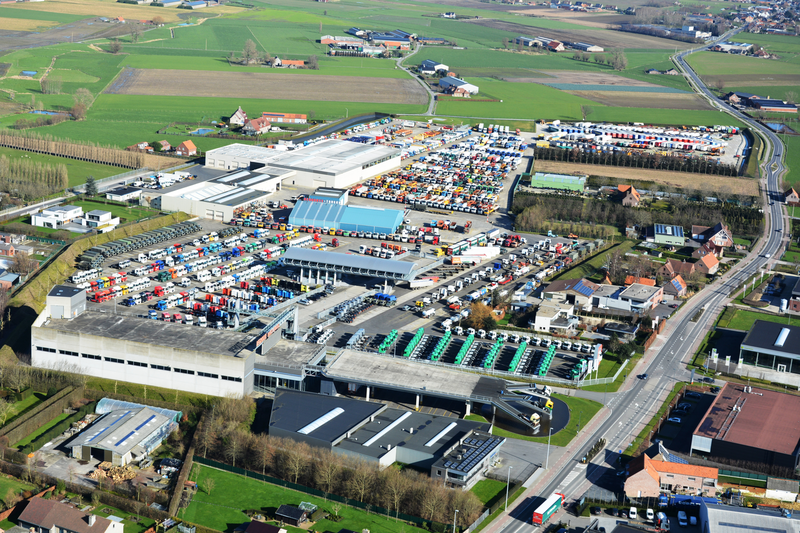 Our headoffice and truck lot are located in Wingene, 100 km from Brussels. The building of our headoffice is perfectly designed. In a close proximity to the truck lot it looks like a tower. Looking down you may see a full stock of tractors and trailers and select the one you need. After the vehicle has been selected we'll bring you to the lot to test the selected vehicle in your presence. Painting facilities are also available at customer's order. Degroote service centre is facilitated with high tech equipment and instruments corresponding to up-to-date standards. Our first goal is to start you out with the right truck - one that meets your needs.